These compact earphones have been engineered to provide superb sound quality with noise reduction. They are stylishly packed and just as impressive out of the box. The sound quality is of a high level and they deliver great clarity and rich bass, making them ideal for any savvy music lover. Design wise you can see a lot of thought has gone into them. 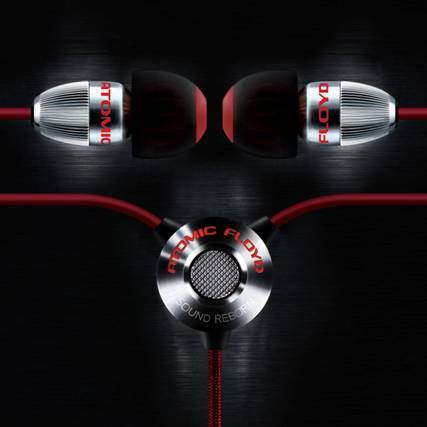 An attractive black and red colour combination, the earphones boast metal fittings as well as 24 carat gold connections along with a fabric covered cord to avoid tangling. They come with three different sizes of ear buds and a cute, compact leather case. The Atomic Floyd Mini Darts are available exclusively from their website – http://www.atomicfloyd.com and the Apple Store -http://store.apple.com/uk/go/atomicfloyd and are priced at £149.99 with microphone and £99.99 without. S/M/L Eartips – Small/Medium/Large silicone eartips block out ambient noise. Performance cable – Anti tangle, high performance fabric audio cord. Leather case – Triple-layered, double-stitched protective leather pouch. Connectors – DJ jack and airplane adapter. Compatibility – Fits iPhone, iPad, iPod and BlackBerry as well as other mp3 players.